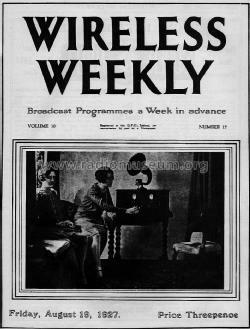 First printed on 4 August 1922, as a quarto size journal of 12 pages for 3d per copy, WIRELESS WEEKLY was published in Sydney by W.J. Maclardy, 2HP, a founder of commercial radio station 2SB (later changed to 2BL), for Publicity Press, the same company that later took over publication of RADIO IN AUSTRALIA AND NEW ZEALAND. The origin of Wireless Weekly stems from discussions between Miss F.V. Wallace, 2GA, who owned a wireless shop in the Royal Arcade, Ron Marsden 2JM, her engineer, and Maclardy. Whilst Wireless Weekly started as an amateurs' magazine, it gradually became a broadcast listeners' journal and with the start of commercial broadcasting in 1923, it featured information about commercial stations and programs. In early 1924 A.W. 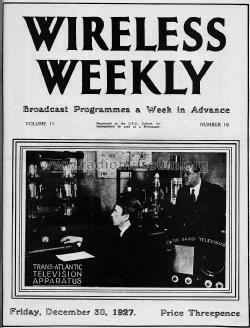 Watt became the editor of Wireless Weekly, a position he held till 1928. The magazine also published many how-to-build projects for the home radio enthusiast to construct. Therefore the company is listed as a manufacturer, too. Click here for the 173 models documented in this literature, i.a.